Do you feel like a child tucked in snug, dreaming of sugarplums, as you anticipate Christmas morning? Or do you feel like a child confined to bed, with flu-like symptoms, as you dread the mourning that accompanies Christmas? Or maybe you experience a complex mixture of joy and grief that leaves you feeling vulnerable and unsteady? The holiday season can be a painful trigger for those who are missing a loved one ’round their table. I used to lack patience and sensitivity towards those who had difficulty celebrating the holidays. Then, I got a taste of unseasoned grief that did not go down smooth. The other day I was down in the dumps with no logical explanation. I could not put my finger on it at first, but then I remembered. I was reliving what happened almost two years ago—around this time that is usually marked by giving thanks. The weeks of waiting turned to months and the months tuned into a year. I felt emotionally pregnant as the ups and downs came. As a #TightlyWoundWoman this unpredictable journey unraveled me. And then, at long last, we got THE CALL. I had just pulled into the grocery store parking lot when our caseworker called. There was a baby boy born. Could we come pick him up soon? It was surreal. After all this waiting and getting ready and getting let down, it was time to receive what our aching, empty arms had longed for. As Hubby and I reached the hospital we entered the lobby area and searched for the familiar face of our caseworker. Her kind eyes looked serious and somber. In an unexpected turn of events the birthmother had returned to the hospital after being discharged and felt conflicted about her decision. Long story short, about an hour later, we headed home with a full diaper bag and an empty car seat. I tried to eat something on the way home, choking down a burger that left me feeling nauseated as the ugly cry surfaced from the depths. As we pulled into our driveway we stuffed our feelings down deep so we could face our children anxiously awaiting their little brother’s arrival. He never came home with us. About a month later we sat with extended family on Christmas morning as gifts were opened. It was my turn to open a gift. It was from one of my sister-in-laws, the one who feels deep and sews prayerfully and dances her heart out and waits long to have babies. I pulled out the handmade gift, a vibrant blanket with material that uniquely displayed our heart for an adopted child. She had finished it and given it to us even though our wait was not yet complete. And there, with twenty eyes watching, my ugly cry surfaced again with uncontrolled eruptions and moans. The beauty of her handiwork invited the unbridled grief out in a unpredictable mess of emotion. My sister-in-law embraced me and whispered hope-words to my broken soul, “It’s going to happen. I know it.” The elephant in the room was exposed as this act of compassion unlocked the mourning. At first I was embarrassed and tried to apologize for my outburst but then I surrendered to the reality of the situation and accepted the depth of care that was demonstrated. Grief and joy intertwined one Christmas morning as we counted our losses amidst the bounty. And maybe it was like that one Christmas morning long ago? Hope sprung forth amidst the backdrop of a dark night. In light of broken lives One was sent to proclaim the good news. The Father knew that with the arrival of His Son, deep pain would be mixed with unending joy. As we celebrate this season let’s not forget those who are grieved through it. Let’s reach out with hands and hugs extended in empathy as they make their way through the hurt. I am grateful for the kind gesture I received in that colorful quilt. God used it to cover me with grace and warm me with hope as my grief was validated and held close. What is one way that you hold those who hurt during the Holidays? Grief takes shape and form through Kate’s poetic writing and reflections, I was able to understand my own grief better and have more understanding and patience with those who are hurting. So often I want grief to hurry up and takes its leave we can all move on. But we don’t move on without it coming along in some shape or form, do we? Thank you Kate for pointing to the hope found in God’s Word without sugar-coating the pain of loss. 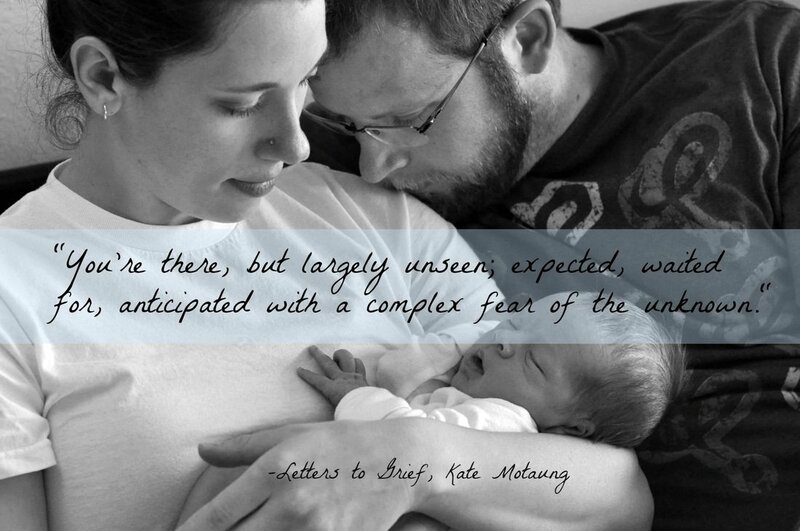 *All images used in this post were designed for the Letters to Grief book release. For more information about custom images for your website or ebook contact me via email. Linking-up with Meredith, Holley, Kristin and Jennifer today. You’re invited to write and read and join together in community as we walk through this season together. Katie- Thank you for sharing this painful story and for using it to bring us to the One who chose the pain to bring us hope. 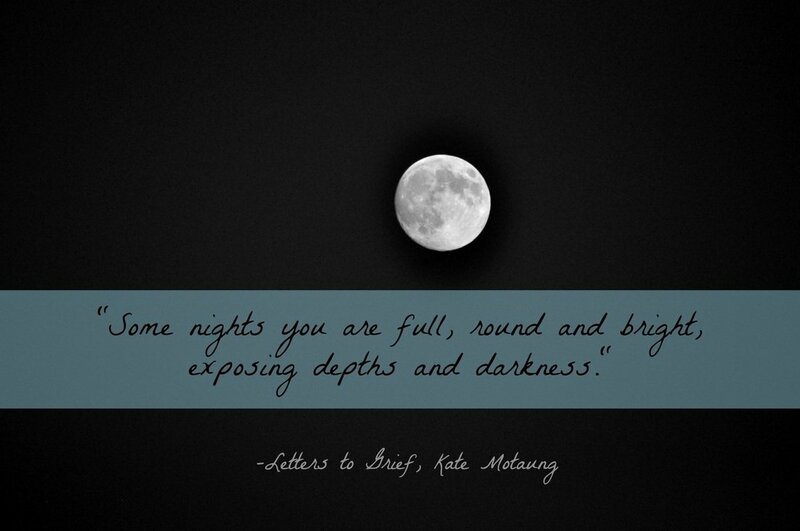 This is stunning writing: “Hope sprung forth amidst the backdrop of a dark night. In light of broken lives One was sent to proclaim the good news. The Father knew that with the arrival of His Son, deep pain would be mixed with unending joy. ” Perfect. This is a treasure. Thank you. Beautiful post, friend. Thank you for sharing. Your sister-in-law sounds like an amazing woman. I think this would be a perfect book for a friend who lost her son just after the holidays last year. Katie, my heart ached for you as I read that story. I can only imagine how yours must have ached. I pray that your little one will come soon. SUCH a powerful testimony you have, Katie! Just incredible. What a moving story. Thank you so much for weaving these words together for the rest of us. Grateful for you and the light that shines through you! I had to take some deep breaths after reading your post. Yet there is hope and beauty in the grief you share. Thanks for opening your heart here so others can know about the hope that God gives. And thanks for linking up at #ThreeWordWednesday. Hugs Kristin, I am sure you feel the weight of these words from that adoptive mama heart of yours. You are doing a great job hosting Three Word Wednesday! Thank you for your validation Meredith and supporting “my own grief story”. I think in our culture we hide our grief a lot because it is uncomfortable to others or we are embarrassed by it. But as I have begun sharing this account more this week I feel freer than burying it down deep and trying to forget it happened. Don’t want to get stuck in the mud but address it enough to go forward in a more healthy way. :) I know you understand this friend. Thank you for your words today about not having the words. You wrote this so exquisitely, I could feel your pain. I hope it brings hope and healing to a heart who needs it! Thank you Sarah. Yes, I hope it brings hope & healing to others as well. 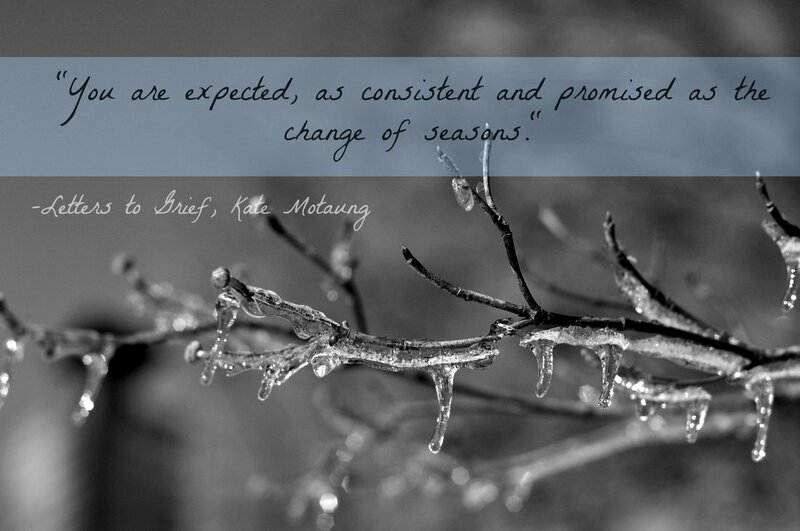 You have beautifully expressed those mourning seasons. I am blessed to have watched you and your family walk through that season with transparency so that I and others might see how to surrender those difficult times to God. I appreciate you and your great big heart for God, your family, and for people. I love you, Sis. Katie, Your transparency, realness, and process toward healing are such a uniting force of Love to others who have faced this grief. For families of loved ones who can do nothing but pray, great reminder that just a handmade item of loving empathy, or note or any contact, can foster healing and aide the hurting to know they are not walking alone. Hands and feet of God. Blessings! Thank you for your kinds word Laura.